Oh, Shakespeare. How I love your brilliance, especially as it demonstrates itself in your histories. For in all of them, you give us a king that is both great and flawed, compelling and distasteful. You make your kings human. This is the element that must be achieved, the balance that must be sought in any successful production of a history play. The Shakespeare Theatre is presenting two history plays in repertory, Richard II and Henry V, both starring the same actor, Michael Hayden. 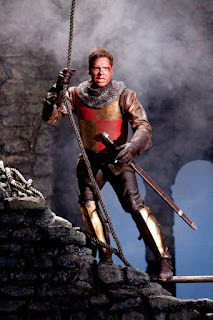 It is curious to me that this same actor succeeds in this element in Henry V, but utterly misses it in Richard II. Maybe Hayden just isn’t right for the part of Richard. I saw this play first, and was then pleasantly surprised when key elements that were missing in Richard, were present in Henry. Hayden completely misses Richard’s sense of humor. In fact, the first laugh in Richard II didn’t come until right before the intermission, two hours in! There’s just no reason for that. But Hayden did find Henry’s sense of humor. Richard is also smart. Shakespeare makes him a beautiful poet, capable of twisting words into new meanings. But Hayden misses this as well, because his verse speaking just isn’t that good in this play. He flattens the poetry, and breaks up the verse, and much of the beauty of this play is lost. But strangely, in Henry V, Hayden seems to respect the verse much more. Hayden really does Richard a disservice, playing him as petulant and whiney, frantic and easily upset, throwing his cape around in tantrums. And his Richard remains this way for the entire play; he doesn’t grow or change. Sure, Richard II is not a strong king. But there still has to be a sense of the noble about him, otherwise, we just don’t care. Take a page from the book of Wallace Acton, who wholly succeeded in making us care about the very similar Edward II. Or from Tom Story, who in Henry V portrays the pouting, obnoxious Dauphin. Except Story manages to be absolutely delightful in doing so. 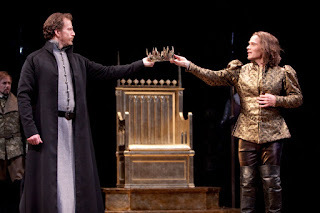 But then, maybe the problem with the production of Richard II is Michael Kahn’s direction, which doesn’t seem to wholly trust the play that Shakespeare wrote. Instead of opening with the play they way it was written, Kahn adds three scenes from the early modern play Thomas of Woodstock, written by the most prolific Anonymous. WHY???? OH WHY OH WHY??? Kahn explains that he thinks audiences find Richard II confusing and so to explain what it going on, he adds this scenes (NOT WRITTEN BY SHAKESPEARE) to clarify the events that took place before the opening scene of Richard II. Pardon me from borrowing the CAPSLOCK from my blogging compatriot but, AAAAAAHHHHHHHHHHHHHHHHHHHHH! Kahn, you’ve been directing Shakespeare for so long, surely you must know that often what is so fascinating about Shakespeare is what he chooses to LEAVE OUT. Rather than explaining the action of the play, these added scenes only serve to diffuse the tension with which Shakespeare began his play. As this play is not done very often, let me explain. Richard II opens with a court scene. You immediately meet the king, and two noblemen, Bolingbroke and Mowbray. These two men accuse each other of treason and demand to be allowed to fight to the death. Bolingbroke accuses Mowbray of plotting the death of the Duke of Gloucester. Mowbray denies this. Eventually Richard prevents the two of them from fighting, and banishes them instead, Mowbray forever, and Bolingbroke for ten years. Shakespeare’s text deliberately chooses not to make clear who is wrong and who is right, and whether or not Richard knew anything about the murder of the Duke of Gloucester. Adding scenes from Thomas of Woodstock completely ruins this. Sorry for the spoiler here, but now when the play opens not only do we clearly see Mowbray murder Gloucester himself, but we clearly hear Richard order his death. Oh Kahn. Shakespeare’s ambiguousness is so much more interesting. The lack of tension Kahn brings us in the opening of the show, continues on through to the curtain. This is the biggest problem with this production. Where are the stakes? Where is the excitement? Where is the danger? The entire play is played at one level. Until the considerable talents of Ted van Griethuysen and Naomi Jacobsen show up. Very late in the play, after Bolingbroke has taken the crown from Richard (Bolingbroke is Henry IV, father of Prince Hal, aka Henry V), the Duke of York (van Griethuysen) discovers that his son Aumerle (Tom Story) is plotting treason against Bolingbroke. He tries to immediately head to the king and report this, even though he knows it will end in his son’s death. The Duchess of York (Jacobson) valiantly strives to prevent him. And here we have the only exciting scene in the play, these two actors are on fire, and working so well together. Unfortunately, two and a half hours into the play, it’s too little, too late. David Muse’s production of Henry V is much more exciting. I didn’t always agree with Muse’s choices, but at least he made some. Up and down is a much more interesting night at the theatre than a flat line. Overall, Hayden fares better as Henry V, but I still think his tactics rely too much on volume, and he had probably one too many pensive looks out into the audience. Still, I appreciate the fact that with this role Hayden wasn’t afraid to play the contradictions. This Henry was noble and strong, but he could also be ruthless. He was both decisive, and unsure about his decisions. I can get behind what Muse did with the chorus, splitting it into three characters. Our chorus (as I interpreted it) was an actress (Robynn Rodriguez), a professor (Larry Paulsen – terrific), and a military officer (Ted van Griethuysen). Muse split the lines according to what they were about. Lines about war, van Griethuysen said, lines about imagination and the play, Rodriguez said, and lines about history and facts Paulsen said. I thought it worked nicely, and gave a lot of dimension to the speeches. Like Kahn, Muse falters in what he added to the play. Namely, Falstaff. It’s probably not unusual to stick Falstaff into Henry V, but I object to the way Muse staged it. I’m okay with dead Falstaff lying in a bed while all the other characters talk about the fact that he is dead. But Muse choose to add Falstaff to the previous tavern characters scene, where Pistol and Nim are fighting about Mistress Quickly. They almost come to blows and Falstaff runs forward to restrain one of them. The physical exertion leaves him coughing and wheezing and he is brought indoors. Then the characters talk about how sick he is and how he’s near the end and how the king broke his heart. And you can’t help thinking, um, actually, I’m pretty sure running fast is what broke his heart. Rachel Holmes is lovely as Katharine, princess of France. It’s nice to see her in this role, since her scenes in Richard II seemed like an afterthought. In Henry V, she is charming, and makes the most of the French scene with her maid. This brings me to another questions. Why, when Shakespeare so clearly demonstrates that he can be hilarious in another language, do we feel it necessary to ruin his comic scene in English by “making” them funny? In other words, what’s with the funny voices? I’m looking at you Fluellen, MacMorris, and Jamy. Shakespeare doesn’t need your bad accents to be funny. Other than that, Muse had some really lovely moments of staging. I loved Professor Chorus’s use of a red light pen on a large map to show us where the play was going. And then that map became a sail as the chorus spoke of sailing across the ocean. The relationships were much clearer in Henry V than in Richard II. As Henry, Hayden’s interaction with other characters was personal and varied. He had palpable moments with Scroop, with Falstaff, with Bardolf, and others. 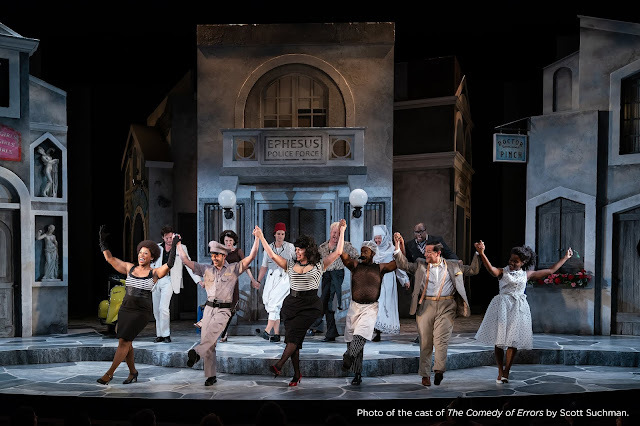 Muse and Kahn working together on last year’s rep, Julius Caesar and Antony and Cleopatra, used staging and design to connect the two plays and give an audience member seeing both a true through-line. They miss all opportunity to do that this year, which is a shame since the history plays are full of passages mentioning past events, and hearkening to future events. I am so completely with you on the AUGH WOODSTOCK bits. They do not clarify the play in the least! You are looking at two different plays, two different authors and contexts, and two very different visions of Richard and his uncles. The change in Gaunt in particular was noticeable -- going from spitting anger in the Woodstock scenes to resignation in the R2 scenes with little to no explanation. Also, I feel quite bad for the actress playing Isabel. She gave it her all and had nothing whatsoever to work with. I also didn't agree with the choice to make the minions drunk in their scene with her -- it diffused so much of the tension from her speech to have Bushy stumbling around. I think you've pinned down a decided lack of tension throughout the entire play, and I am at least glad to hear Henry V is better about it. And that Hayden is a better Henry than he is a Richard. The role felt like it had been simplified far, far too much. Thank you. I walked out because of the prologue. "This is not Shakespeare" is what I said to the usher who came up to ask what was wrong. "It's only two scenes" was her reply. As far as I am concerned, Kahn may as well have added something from the Ritz Brothers. It's also astonishing to see this egomaniac being congratulated by critics for this mutilation of the text.